Kristin Folger shows off her color study skills in front of her very colorful muses. Welcome to one of the best locations to practice sketching and drawing animals. Whether you are a novice or a practiced artist, Woodland Park Zoo offers hundreds of opportunities to polish your skills. Ready to get started? Download our free Woodland Park Zoo mobile app (for iOS and Android), visit the Maps tab, then tap on Tours to find the Sketching Animals GPS-guided zoo tour. 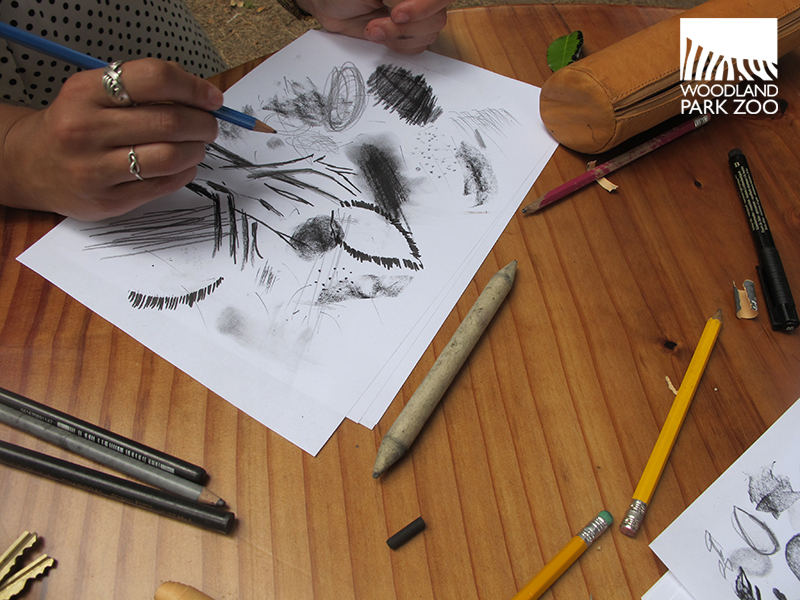 On the tour, you’ll be prompted to work on a few different facets of sketching throughout the zoo. You may choose to spend a couple minutes on each prompt or spread the tour out over a few days if you like. With so many muses, you are bound to leave with some beautiful artwork as well as a deeper connection with your subjects. The tour explores 5 different phases of sketching including: gestural drawing, details, landscape elements, mark-making and color. Follow the prompts to get started and be sure to share your work with us on Facebook, Twitter or Instagram using #woodlandparkzoo and #sketchinganimals. 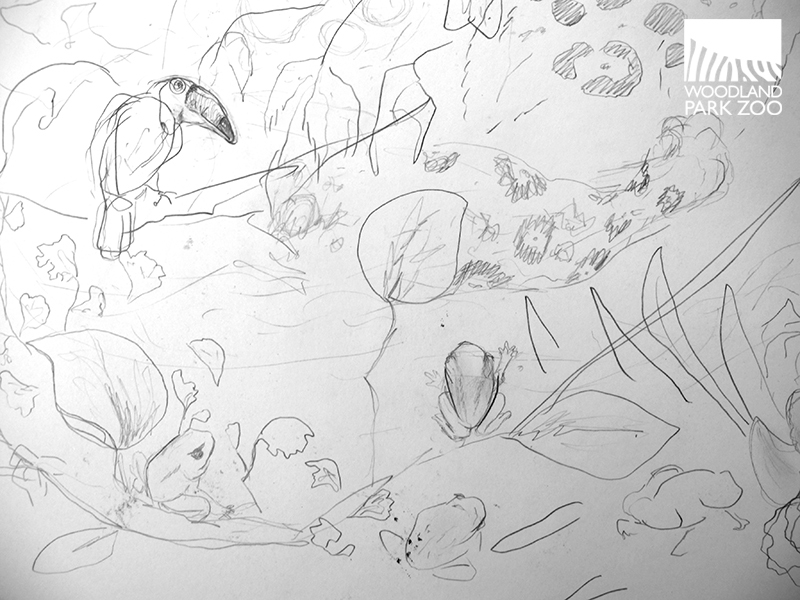 Tropical Rain Forest gesture sketch by Kirsten Pisto. Drawing and zoology share a rich past. The oldest example of a human drawing is a cave painting over 40,000 years old—and people have been drawing animals for just as long. Throughout time people have been fascinated with studying the creatures around them. We've drawn animals to trace migration for hunting, to express our mythological and spiritual connection to them, to record new species, to study their behavior, to enhance education, to plead for their preservation and at last to depict the wonder and awe we might feel while in their presence. 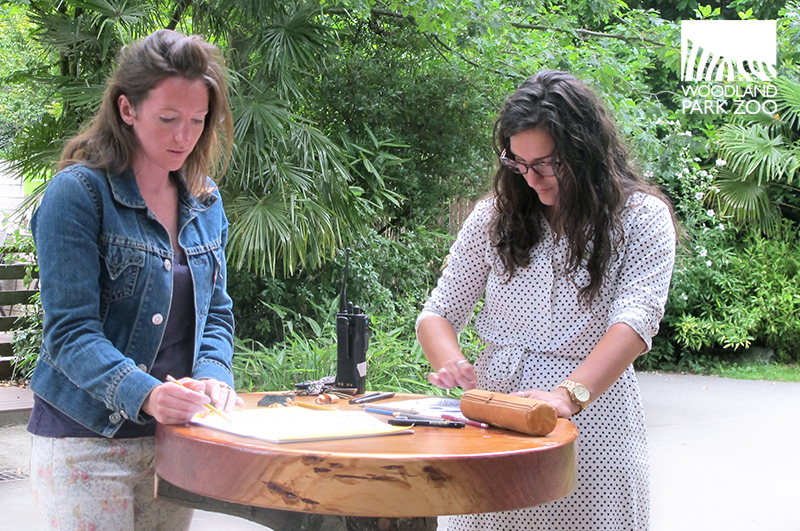 In-house artists, Kirsten and Caileigh, take advantage of the tables near Chowder House, the perfect height for a quick sketch! 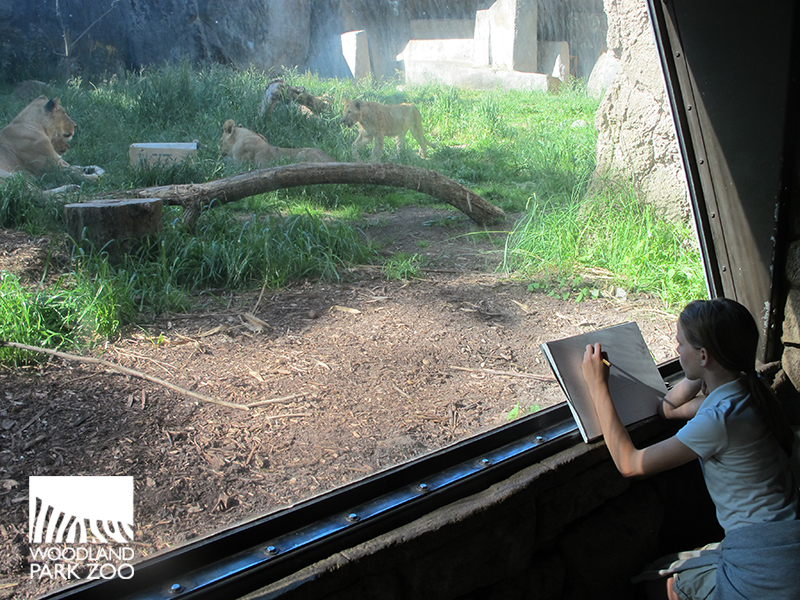 Young artist Kristin Folger finds some quiet time to sketch Adia and the cubs. The practice of drawing allows an artist time to connect with their subject and can be one of the best ways to understand another species. Many staff here at Woodland Park Zoo—from zookeepers and horticulturists to graphic designers and exhibits crew—practice sketching in their free time. This artistic crew can be found drawing on their lunch break and even as part of their job designing. Having a multi-talented staff is just one reason the zoo is such a great place to work! 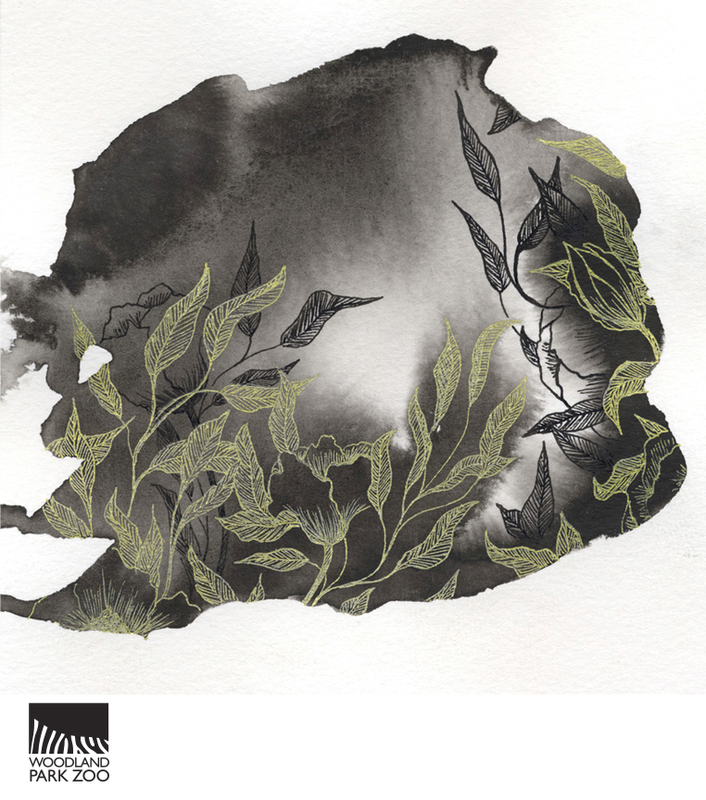 Ink Study #3, by Misty Fried, our very own senior graphic designer. Tawny frogmouth and chick, by Josh Pettitt, a very talented member of our grounds crew. Two versions of a tree kangaroo. 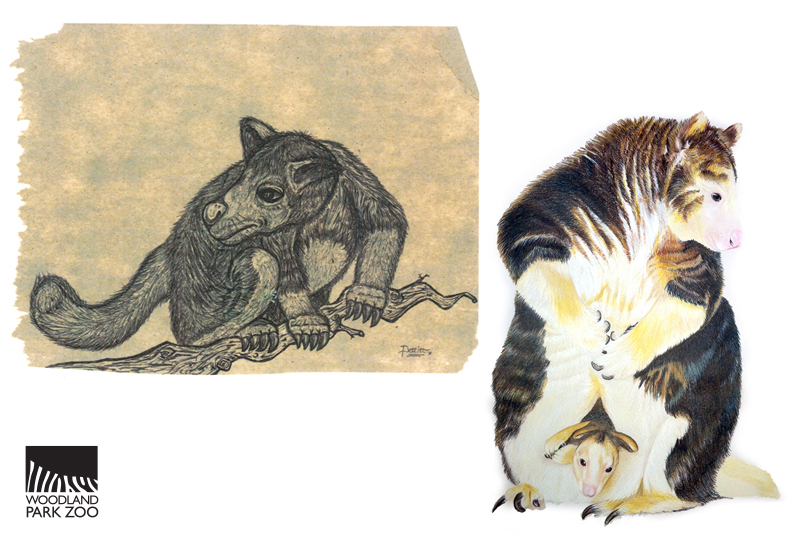 Left: Tree Kangaroo, ink on paper towel by Josh Pettitt. Right: Tree Kangaroo and joey, a painting in progress by Susan Pope. You’ll also see zoo guests and even organized drawing clubs sketching all over the zoo. If you are really lucky, you might run into one of the students from the University of Washington Natural Science Illustration program. Illustration of Thylacine, a species known as the Tasmanian tiger which went extinct in the 20th century, by Susan Pope. 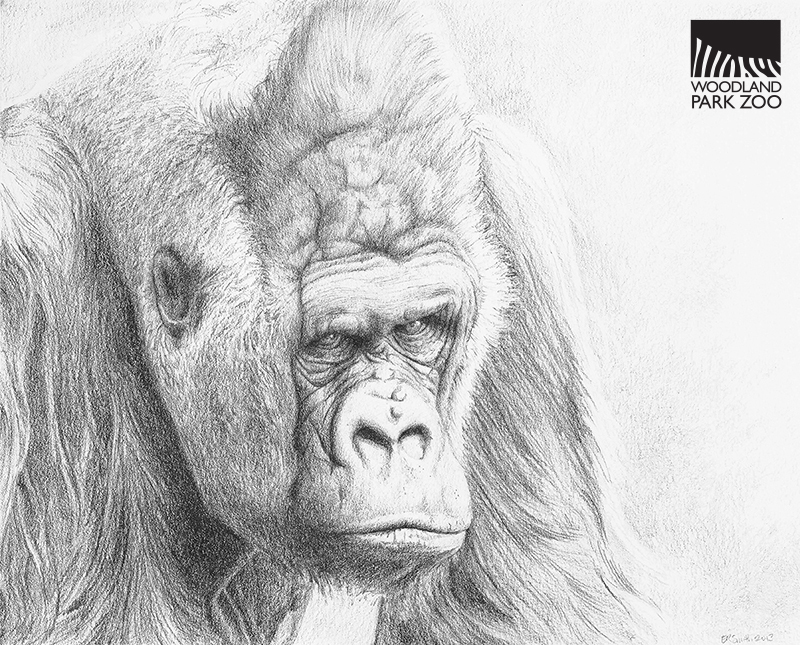 Susan Pope is a recent graduate of the University of Washington Natural Science illustration (UW NSI) program and says that while sketching at the zoo can be challenging, it is also very rewarding. 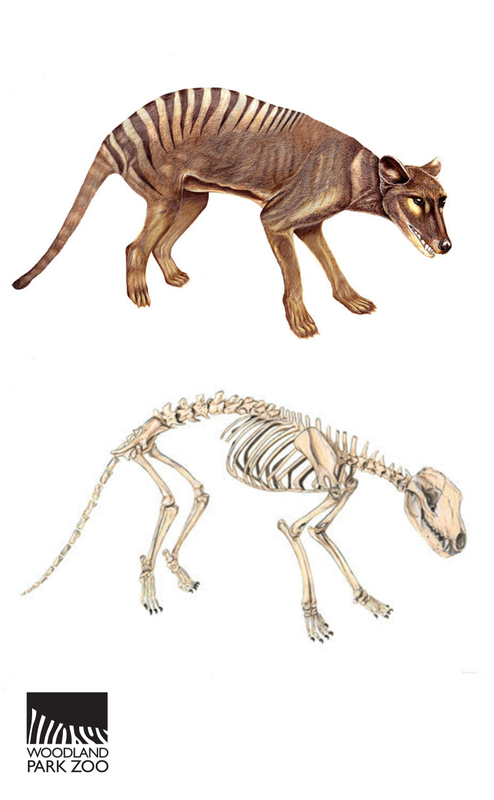 Illustrations such as the Thylacine assist zoologists and conservationists alike. Having a visual of an extinct species helps educate and inform studies. Visit Susan’s website for more amazing illustrations. Elizabeth Smith, a fellow graduate from the UW NSI program shares a few tips. 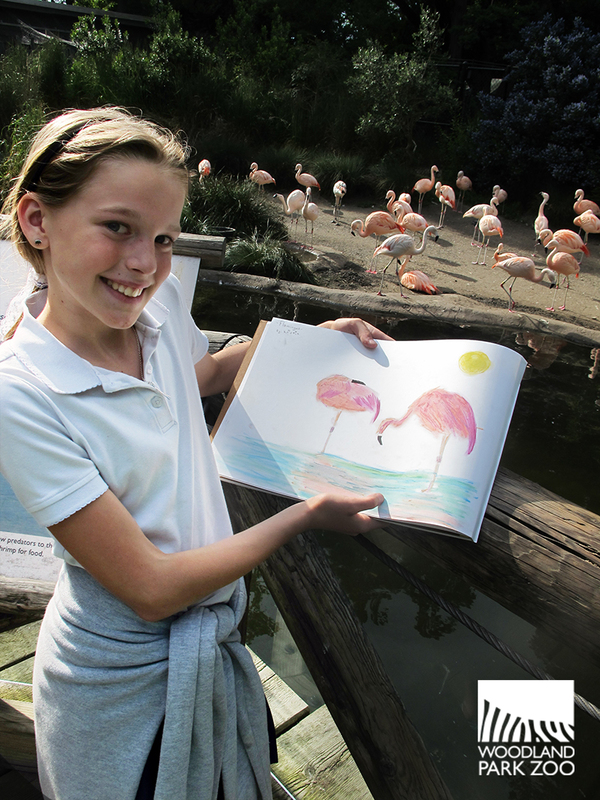 “I've found it challenging to draw at the zoo. Sometimes the animals will hold still for longer poses, but most of the time they're either sleeping or moving, so an artist needs to practice quick sketches. I like to find spots where I can either sit down (ideal!) or at least rest my notepad against a railing while I draw. It's important to find a time when the place isn't crowded, too.” See more of Elizabeth Smith’s work. 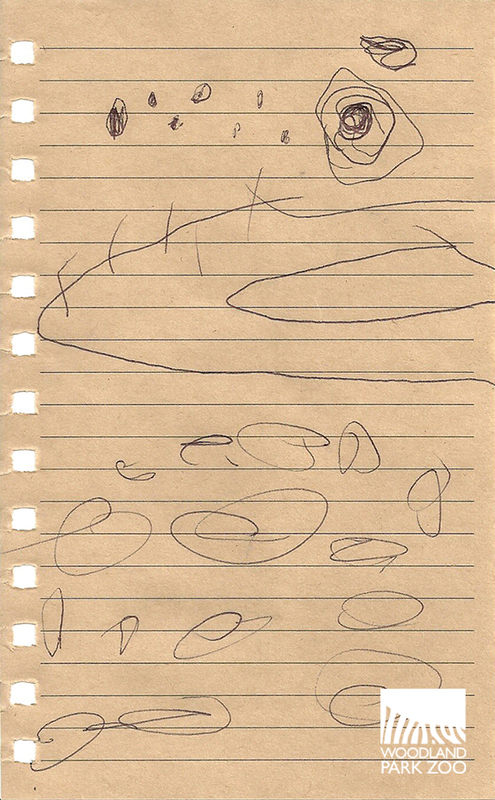 Swirling water and river otters, by unknown young artist. Caileigh Robertson does a quick texture study near the Bamboo Forest Reserve. I've been drawing on my own at the zoo for a few years-- I'm so excited to see this program become available! I didn't know that this program existed until now. What a wonderful thing to do. I have never been a good sketcher and find I do better with photographs which don't move and from them can create a finished piece. This might be a good field trip for one of the art groups to which I belong.